Grape source: Oatley Vineyard, Cannington, Somerset. Vineyard parcels: Madeleine upper block, Madeleine lower block. Trained on 90 cm-high originally spur-pruned cordons, converted to double guyot 2015. Kernling upper block, double guyot on 90cm conventional trellis, Kernling lower block double guyot on 140cm single wires, hanging canes. Bronze Medal: Decanter World Wine Awards 2017. Citation "Well composed wine fruity with currents, freshness well balanced with a marriage of fruits and acidity." An unusually cool year with some frost losses in the Madeleine. A dry spring after a mild winter brought an early budburst on 19th April, but anticyclonic weather in the last week of April brought night frosts that were worst in low lying areas in the west of England. It was minus 2.8C at Oatley on 27th and we had a further frost when the shoots were well out on 13th May. We lost about a third of the buds in the lowest lying corner of the Madeleine Angevine - perhaps 10% of the Madeleine potential crop. The cool, dry weather continued and flowering was lateish at the end of June. A brief heatwave in the last week of June with temperatures in the 30s set the early flowers quickly but cooler weather set in before the fruit set was complete, leading to more-than-usual variation in ripeness in both varieties, with the lowest part of the slope 10 days behind the top. The summer continued unusually cool and veraison was around 10 days late. The Madeleine was harvested 2 weeks later than 2014, and the Kernling, which fortunately was carrying a small crop or it might not have ripened at all, at around the usual date, on 25th of October, with good sugars but the skins still quite pale (the photo in the page background was taken 9 Oct 2015) and acidity rather high. 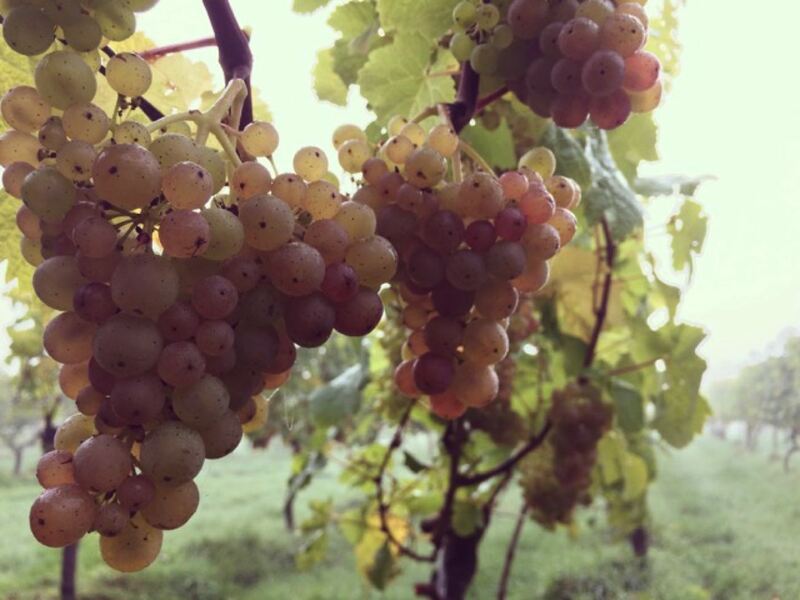 We have learned not to leave the Kernling beyond the end of October as there is very little further ripening then and the quality starts to suffer. Our neighbouring shoot had not put out young pheasants this year so bird losses were minimal. Madeleine: 4th October 2015 in dry but cool, misty weather. Grapes pictured top right arriving at the winery, Jane’s blogpost about the harvest day here >>. Kernling: 25th October on a golden, sunny day. Temperature about 15C at max. Grapes, clean, good condition, no wasp, little bird damage, no disease, but pale, hadn’t reached the usual dark pink. Winemaker: Steve Brooksbank, Bagborough Lane, Shepton Mallet, Somerset BA4 6SX. Madeleine crushing/pressing 5 Oct. Free-run juice: sugar 66 Oechsle, acid 7.5 g/l acid. Kernling crushing/pressing 26th Oct, free run juice 75 Oe, acid 15 g/i. Wines vinified separately in stainless steel tanks. Blended. Bottled 30 Mar 2015: clear, 400g 75cl Bordeaux bottles sealed with best quality cork. Label FSC certified Tintoretto paper. 2677 bottles made. Other times: we're open for sales if we're here. Tours and tastings welcome by appoinment.